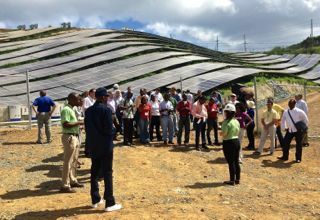 Some 40 participants of the first Caribbean Clean Energy Technology Symposium wrapped up the four-day conference Friday with visits to St. Thomas’ three energy and utility facilities. The 40 site visitors, part of a total of the symposium’s more than 270 participants, visited the V.I. Water and Power Authority’s Estate Donoe Solar Power Plant, the propane storage facilities at the Randolph Harley plan in Krum Bay, and the Seawater Reverse Osmosis Facility. The facilities were part of the reason that the territory beat out other Caribbean island competitors such as Jamaica, Puerto Rico and the Dominican Republic that had also put in bids to host the symposium, according to V.I. Energy Office Director Elmo Roebuck Jr.
“This is the first time this has ever been done, because focus has not been given to the Caribbean in the past,” said Roebuck. That changed, however, when alternative energy solutions in the territory began drawing attention. During the first Caribbean Energy Summit held in January in Washington, D.C., Vice President Joe Biden commended the territory for projects such as the Donoe Solar Plant and the propane conversion, according to Roebuck. Roebuck said his office then partnered with the Economic Development Authority and WAPA to bring the first Caribbean Clean Energy Technology Symposium to the territory. “The function of the symposium is to be a collaboration of the ministry heads of the various Caribbean islands so that we can meet under one roof to collaborate their alternative energy and renewable energy efficiency programs,” said Roebuck. Caribbean ministry officials were not the only ones who showed up, however. The 270 representatives came from various countries around the world, including the United States mainland, Canada, and some European and South American countries. “We did not anticipate this massive turnout,” said VIEDA Chief Executive Officer Percival Clouden. The symposium broke up the participants into clusters engaged in panel discussions and presentations. Representatives from the U.S. Department of Energy, the Environmental Protection Agency and various energy companies led discussions ranging from energy efficiency and economic development to best practices in the Caribbean and the United States. Currently companies qualifying for EDA benefits may get a 90 percent exemption on corporate income tax and business owners can get a 90 percent reduction on personal income tax. They also pay no gross receipt taxes, no property taxes, no excise taxes and pay only 1 percent on custom duties. The response to the EDA benefits presentation was “overwhelming,” according to Clouden. “It shows that out programs are well heard of and we have many interested entities who want to capitalize on our program, which of course, is the best in the world,” he said. Roebuck said the “huge strides” the territory has been making do not stop with the solar farm and propane conversion, as the government continually looks for way to move away from one-source dependency. The territory, for example, is already looking at the first steps toward an all-electric fleet of government vehicles. In 2014, the V.I. Energy Office purchased two 2015 Nissan LEAFs, largely recycled and recyclable electric cars launched in 2010. The two vehicles are the start of a pilot electric fleet program, according to the Energy Office. The Energy Office is also looking at improving aging infrastructures, reducing the government’s energy consumption, and increasing the minimum percentage of electricity from renewable sources by 25 percent by 2030.